Bharatiya Janata Party (BJP) president Amit Shah on Friday continued to undermine the Congress in Madhya Pradesh, accusing them of misgovernance "from Panchayat to Parliament" for 55 years in the state. 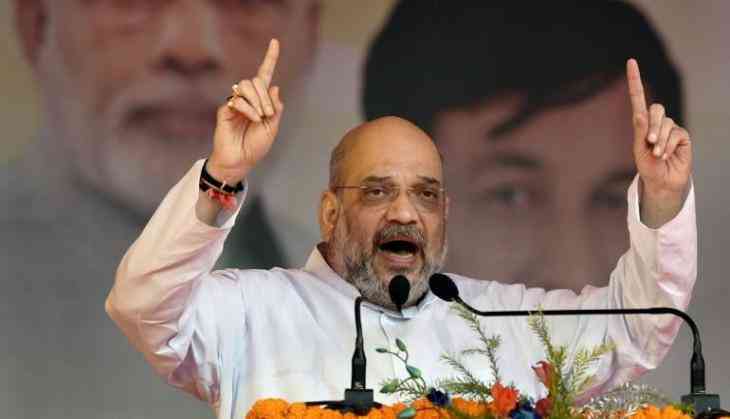 Addressing a campaign rally, Shah stated that like dominoes, the incumbent Congress governments kept falling in a number of states around the 2014 general elections, when the BJP-led National Democratic Alliance was elected in the Centre. "First Maharashtra, then Haryana, then Jharkhand, Kashmir, Assam, Manipur, Meghalaya, Nagaland, Tripura, Himachal Pradesh, Uttar Pradesh, Uttarakhand, people everywhere recognised who will actually work for them and they ousted the corrupt Congress," Shah said. He further stated "They have ruled here from Panchayat to Parliament for 55 years, was there ever electricity, water in your homes? They had no concern whatsoever for eh tribal people. Water and electricity in your homes have been connected by the BJP." Shah said that unlike Congress, the BJP-led government has helped the farmers of the state. "We have not only established a minimum support price (MSP) for wheat, rice, corn, etc, we also buy the farmers' crops. What did they ever do?" Shah said. He said that during the Congress' rule, farmers in the state had to wait in long, gruelling ques to acquire urea. "Prime Minister Modi introduced Neem coated urea and abolished black marketing of the product. Farmers don't have to wait in ques anymore," Shah said during an address at Balaghat. He also aimed a potshot at Congress president Rahul Gandhi, saying that while the latter keeps talking about agriculture and farmers, he knows nothing about farming. "During your rule, farmers were beaten up over urea," Shah said. The BJP president said that all the welfare schemes in the state have been made possible because of the increased budget the Central government has made available to the state. "Under the Sonia and Manmohan-led Congress government, the state received Rs 1,34,190 crore. But under the 14th Finance Commission, Prime Minister Narendra Modi ji's government sanctioned Rs 3,44,126 crore for the state," added Shah. As the state inches closer to the November 28 polls when the state will elect the 230 members of legislative assembly, with the results scheduled to be declared on December 11, both the incumbent BJP and the opposition Congress have heightened their efforts to sway voters in their favour. Continuing that effort, the BJP president said that the current Central government has put a check on the illegal immigrants in the country, which the Congress used as a voter-bank. "Under the Congress, a lot of immigrants used to enter the country, who they (Congress) used as a voter-bank. In Assam, we implemented the NRC and ousted 40 lakh illegal immigrants," Shah said.